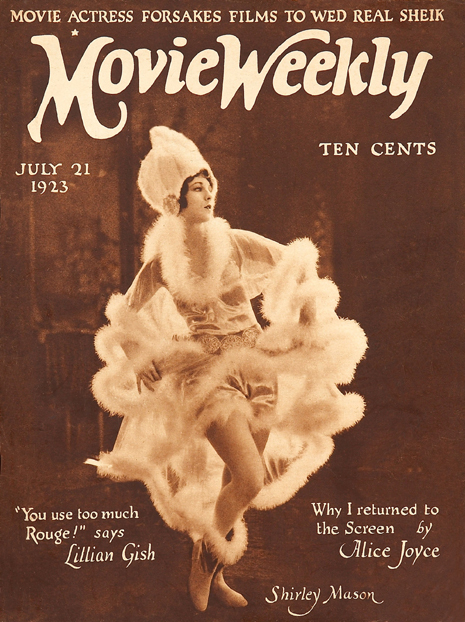 Ann Pennington graces our latest Movie Weekly cover. 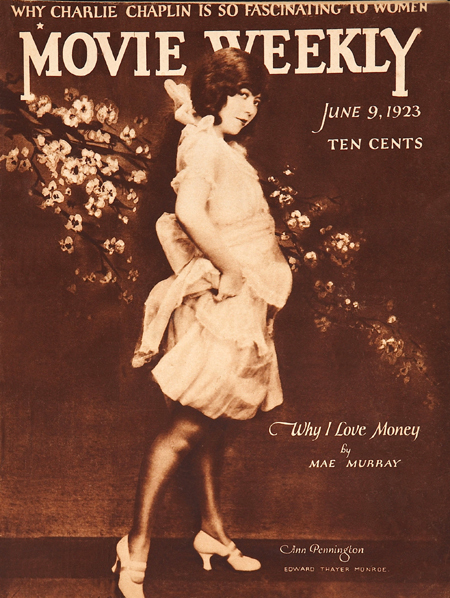 Just why does Mae Murray love money? Probably for the same reasons the rest of us do. It wasn’t unheard-of for prominent film folk to be impersonated by shifty characters. 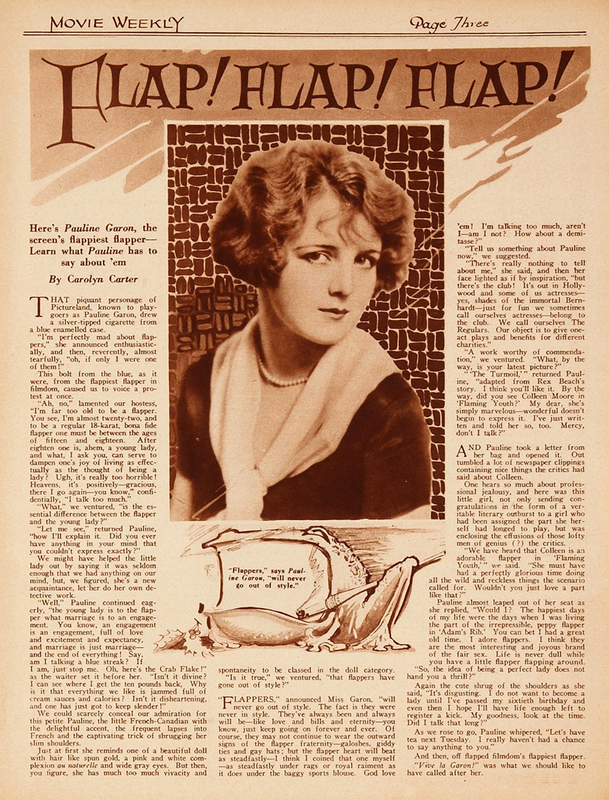 A few years earlier, someone claiming to be D. W. Griffith had been “fleecing guests in poker games at Eastern resorts,” according to Photo-Play Journal (October 1920). 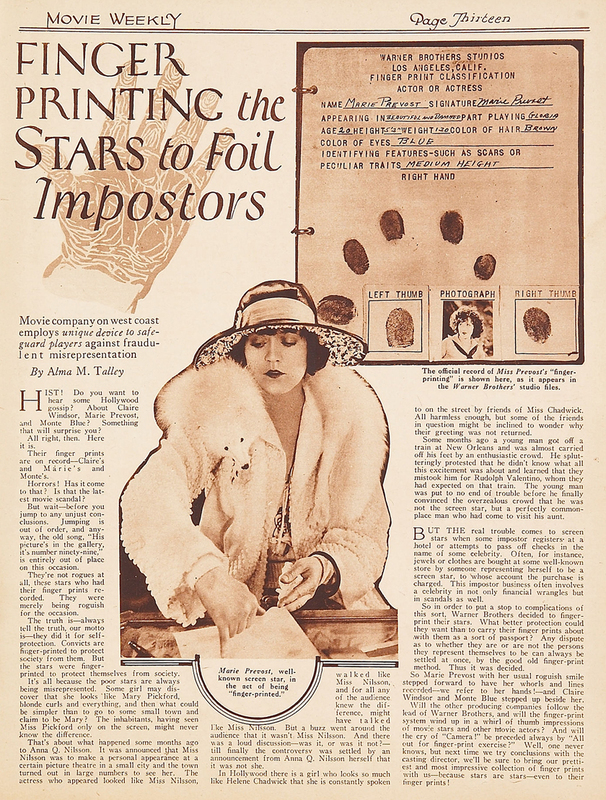 It still seems unlikely that Warner Bros. would be finger-printing its stars, as this article claims, but here’s a copy of Marie Prevost’s ID card to prove it. I wonder if it’s still sitting in a musty file cabinet right now. 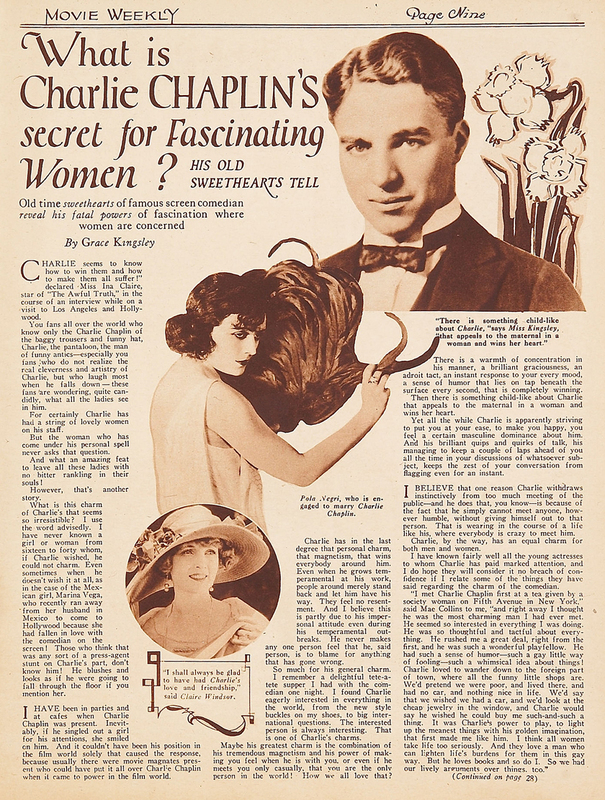 A month later, Movie Weekly ran an interview with Claire Windsor (“Male Vamps I Have Known,” July 28, 1923) in which she elaborated on Chaplin’s appeal. 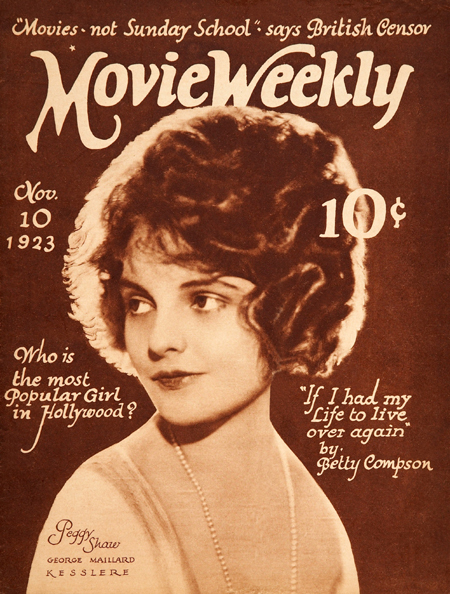 This time around, our Movie Weekly cover girl is Allene Ray. She may have been a delicate flower in this photo, but audiences would soon know her as a serial queen, who bravely faced a new peril in every episode… and performed her own stunts. 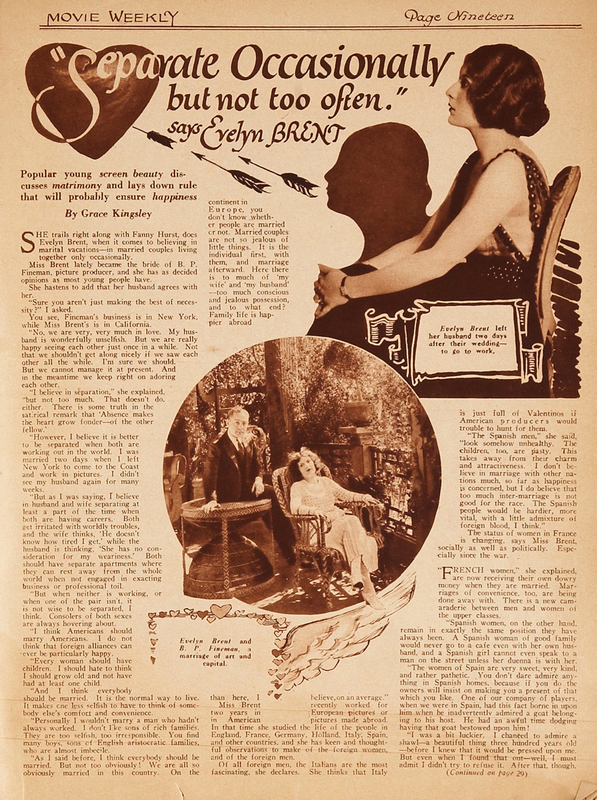 In the same issue, Evelyn Brent advises women to separate from their husbands from time to time. (In her case, those separations would end in a pair of divorces.) This being Movie Weekly, the interview somehow leads to a bizarre and politically-incorrect digression about Spanish men and race-mixing. 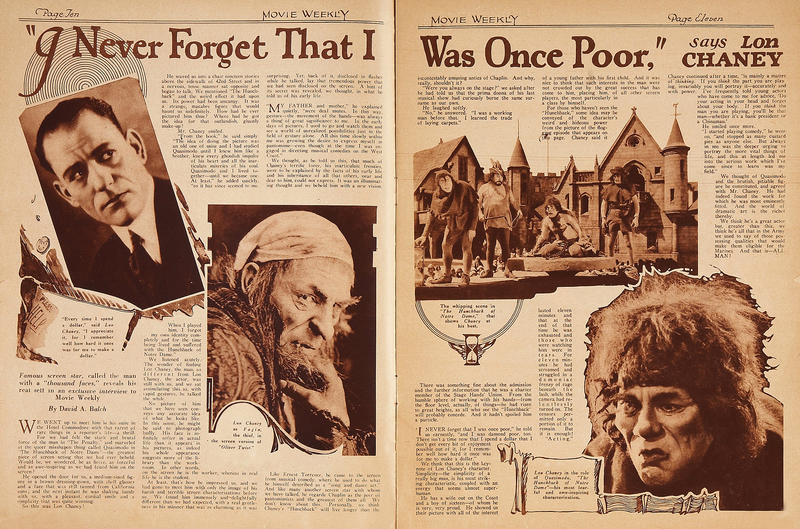 A rare interview with Lon Chaney covers his early life, his approach to acting, his opinion of Charlie Chaplin and some background on The Hunchback of Notre Dame. 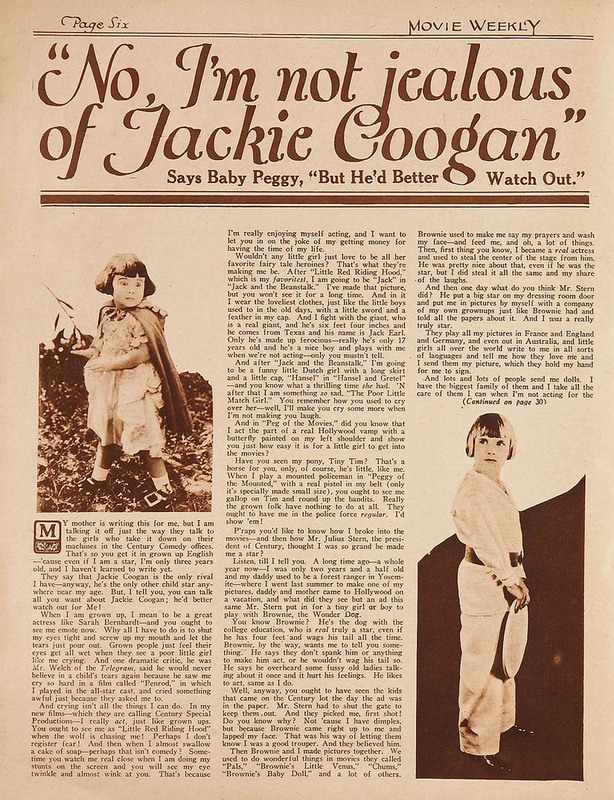 Movie Weekly‘s impressed editor concludes with remarks that seem to foretell the film that would be the star’s last big hit, Tell It To the Marines, four years later. 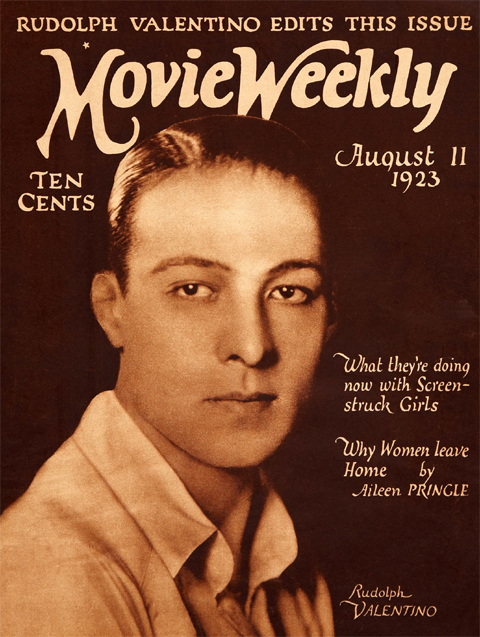 As mentioned in last weekend’s update, Rudolph Valentino edited an issue of Movie Weekly (kinda sorta). Here are some highlights. Rudymania on the march. Lots of gushing background on the star, along with another photo of him selecting stories and photos for the issue. 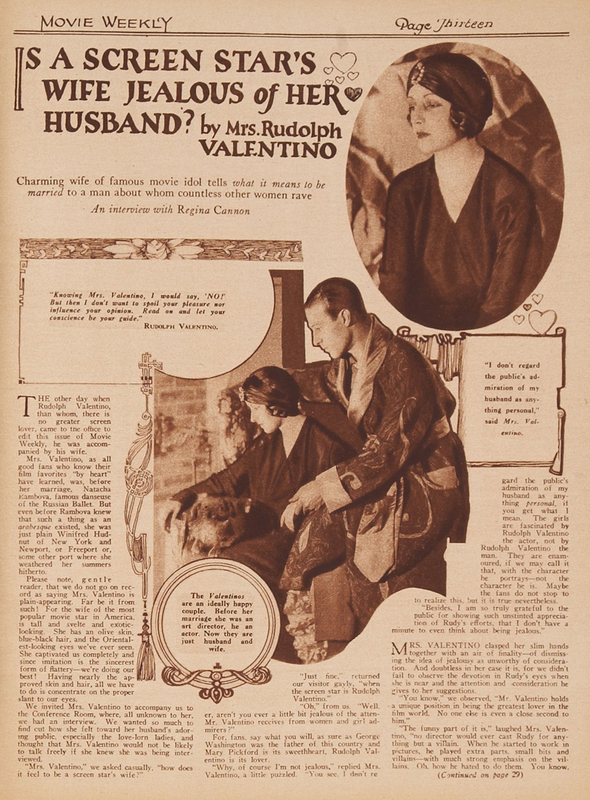 Mrs. Valentino claims not to be jealous of her husband’s fame. Uh huh. 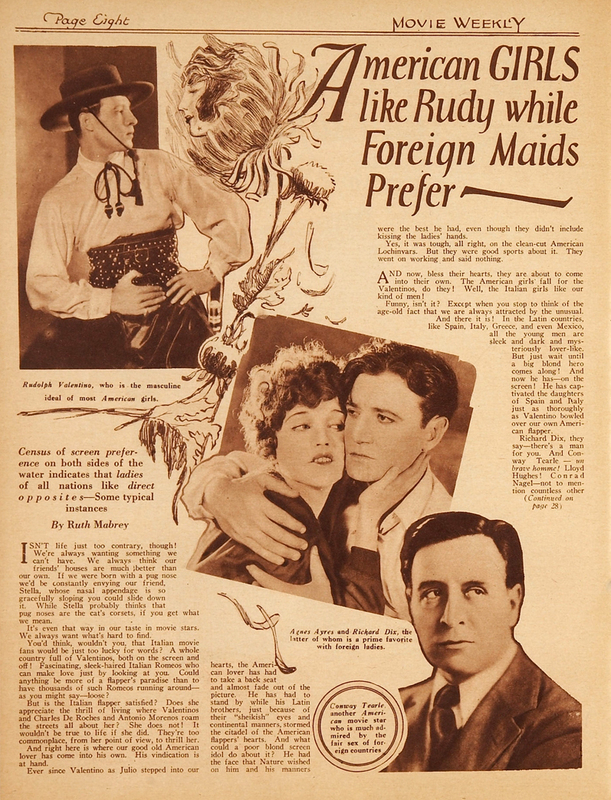 Interviewer Alma Talley seems incredulous to discover that Rudy’s love scenes were just acting after all. 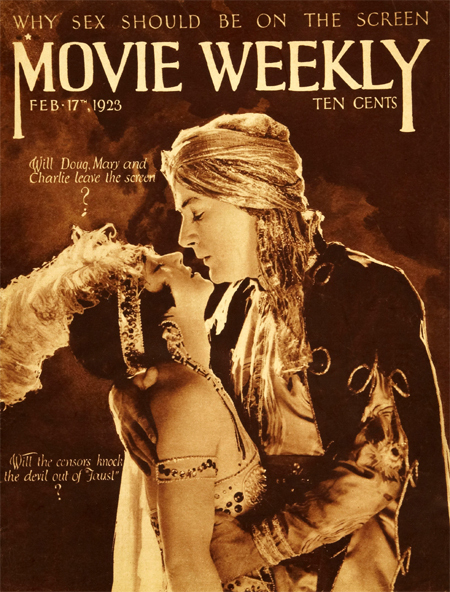 Our latest Movie Weekly offers an ardent embrace from a faraway land of exotic romance. Miriam Cooper and Kenneth Harlan are the passionate pair, and while the all-American Harlan seems a bit out of his element, Miriam looks blissfully at home in the dream… and exceptionally well-dressed for it. 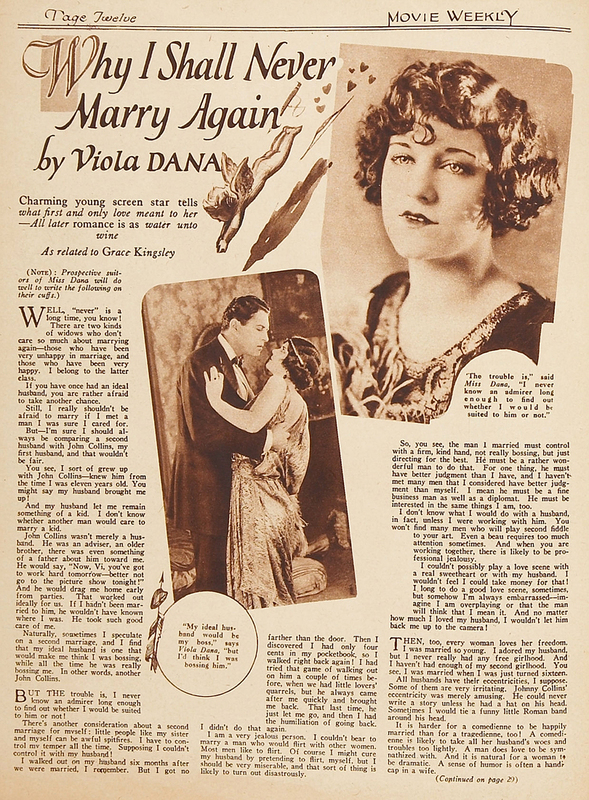 Author Alma Talley assures us that, while Ramon Novarro may be Mexican, he’s no “greaser.” He’s certainly a fan of the flappers (and the feeling is mutual)… but I wouldn’t count on his marrying one. 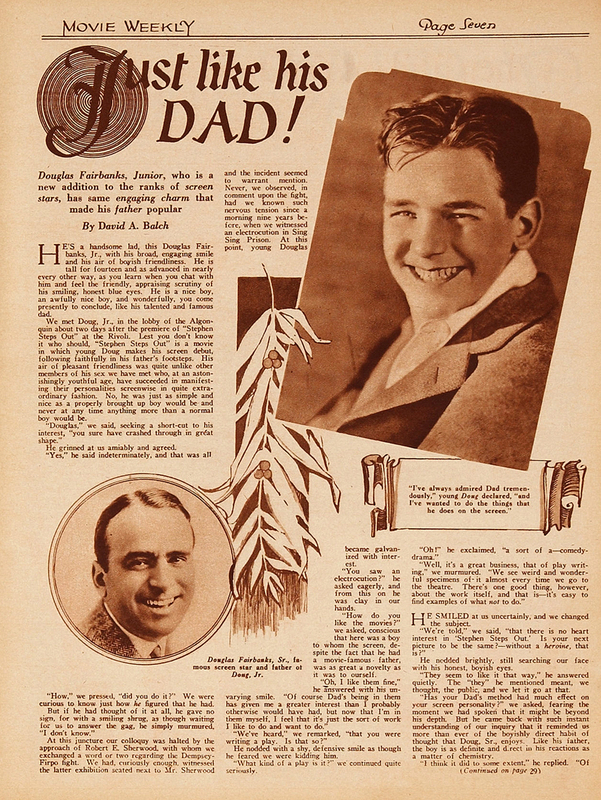 Most of the silent-era movie magazines had an “Answer Man,” and Movie Weekly filled that role with “The Colonel.” In this column from the September 29, 1923 issue, he helpfully answers your questions and gives out the home addresses of the stars (for those of you who are really determined to meet your favorites). 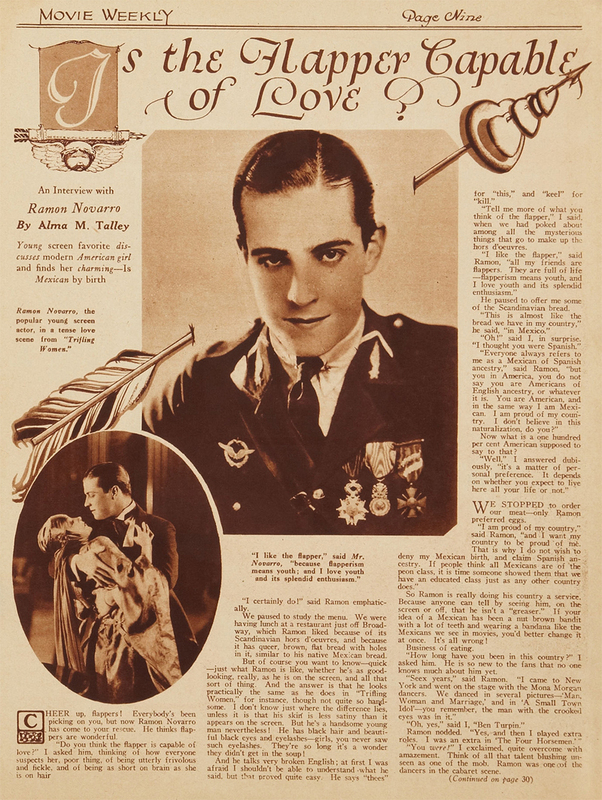 He’s a bit off the mark where Ricardo Cortez is concerned, but otherwise the man knows his onions. 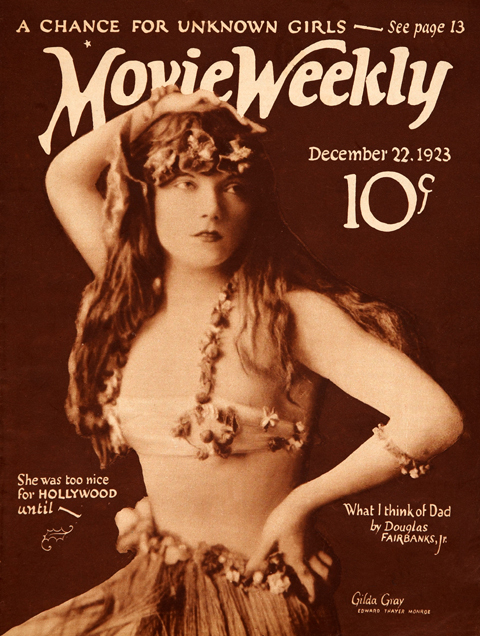 If the girl in the photo looks vaguely familiar, you’ve probably seen Buster Keaton’s Seven Chances. She’s the hat check girl in that one. 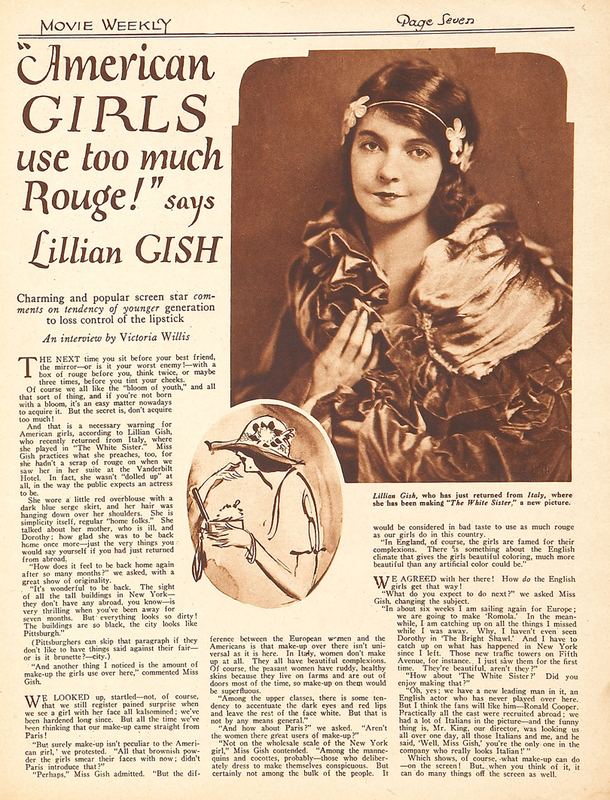 Looks like she was also in Colleen Moore’s Flaming Youth, which would be news to the Internet Movie Database. 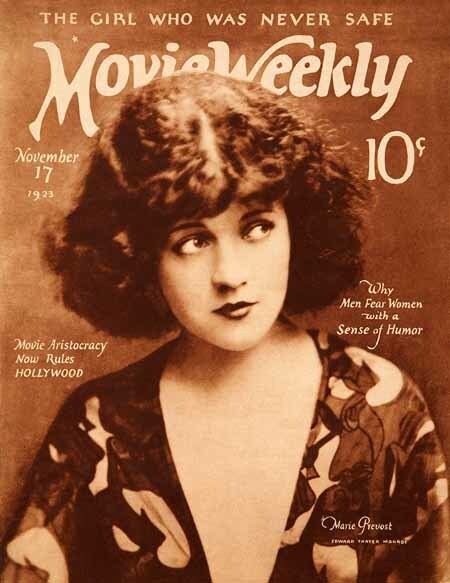 Pert little Pauline Garon is an obscure figure to us today, but back then she was in the vanguard of screen flappers. 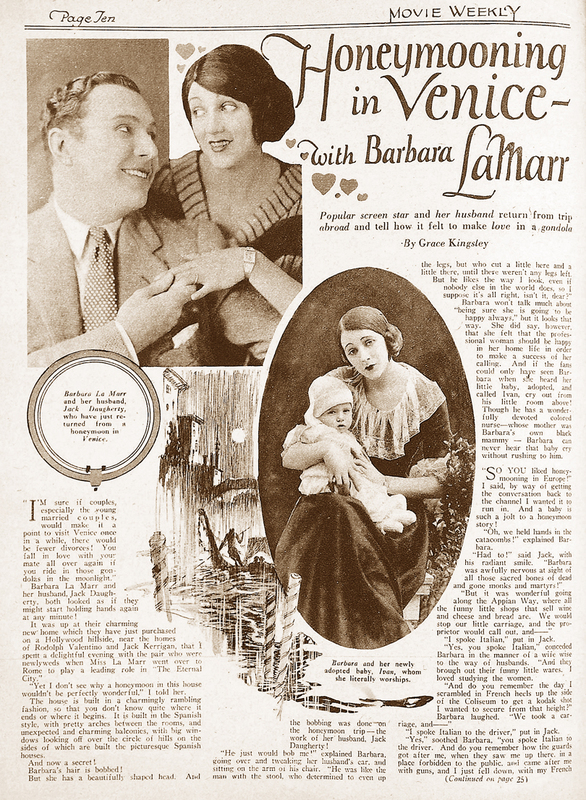 Sadly, little of her work is in circulation now, apart from 1924’s The Average Woman, which I produced on DVD myself (with Bessie Love’s The Sea Lion as a double feature, $18.95 cheap, makes the perfect Christmas gift, plug plug plug). Anyway, she was quite the firecracker… a quality that never does go out of style. 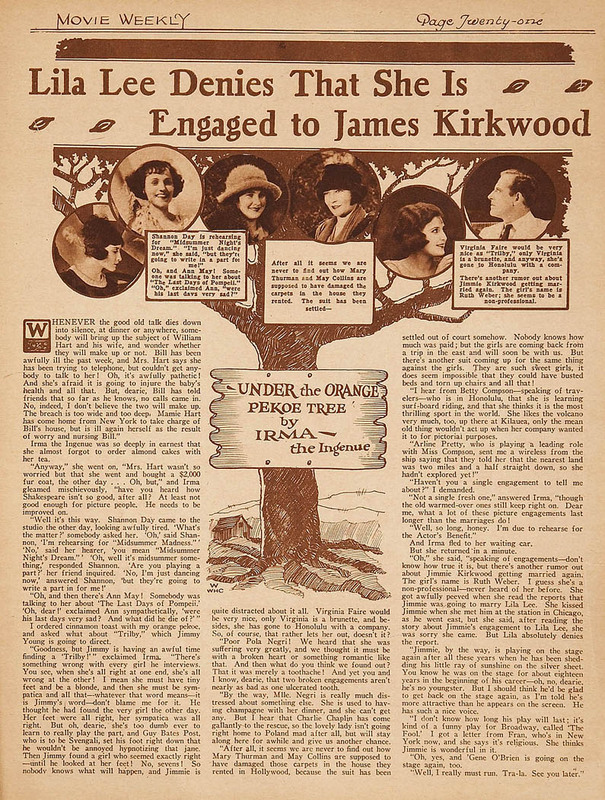 The publicity mill turns for the almost unrecognizably young Douglas Fairbanks Jr., on the occasion of his first starring role, in the adventure comedy Stephen Steps Out (1923). Last week, I posted a couple of articles from this issue… here are a couple more. 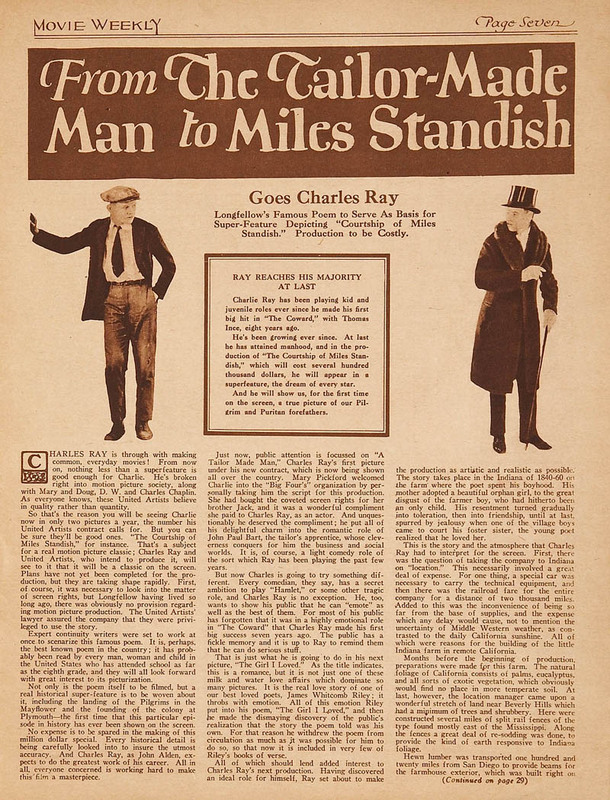 Charles Ray discusses his new productions for United Artists, including his upcoming “super-feature,” The Courtship of Miles Standish. No expense will be spared. And as a United Artists producer, all of those expenses are being paid out of Ray’s pocket. Because of exhibition contracts, UA releases tend to earn best in big-city picture palaces. But Ray’s fans are mostly in small towns and rural areas. Can you guess how this story ends? 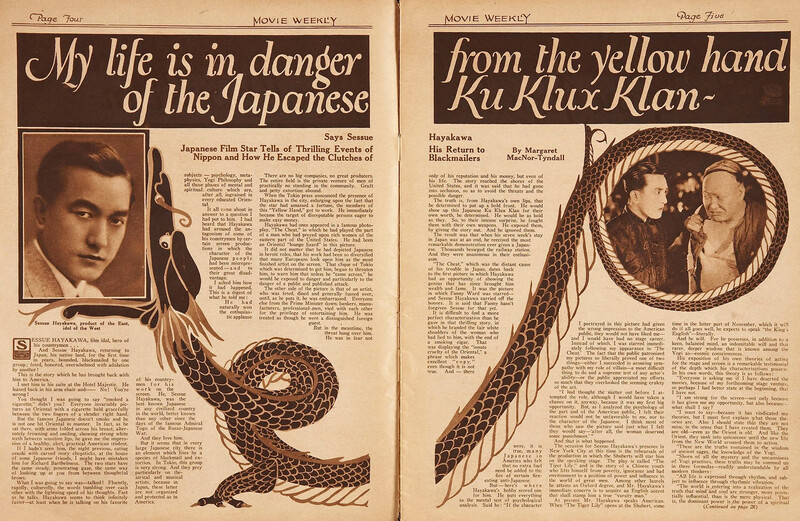 Bucking all the odds, Japanese actor Sessue Hayakawa had become a star of the American silent screen. 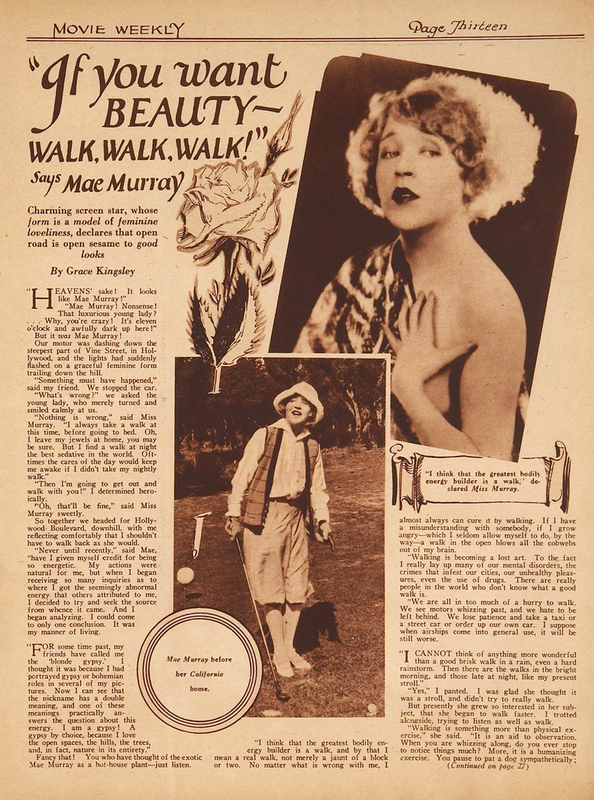 But his career was on the downswing in the early 1920s, and he left Hollywood behind. Ironically, when he returned to his native country, he found himself a controversial figure, considered too Americanized at a time of rising Japanese nationalism. What do you do when you’re too Japanese to suit the Americans, and too American to suit the Japanese? You move to Europe. 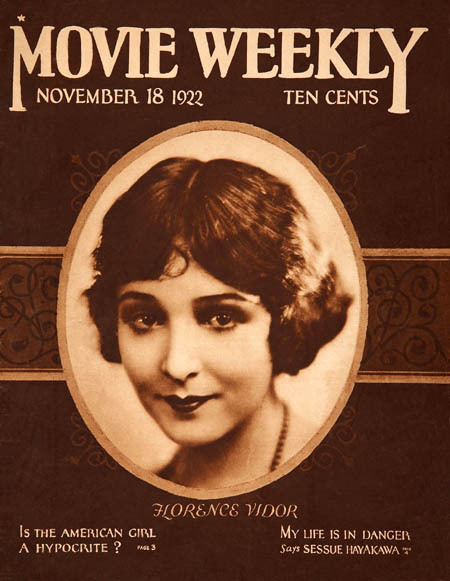 Florence Vidor’s our cover girl this week. If the American girl is a hypocrite, I’m sure it’s someone other than Florence. There’s no one I’d rather share almond cakes and tea with than Irma the Ingenue, and here she is to dish the gossip. Seems a bit unlikely that a four-year-old would be this articulate. But never underestimate Baby Peggy. Besides, would Movie Weekly steer you wrong? The Bad Movie is Doomed! 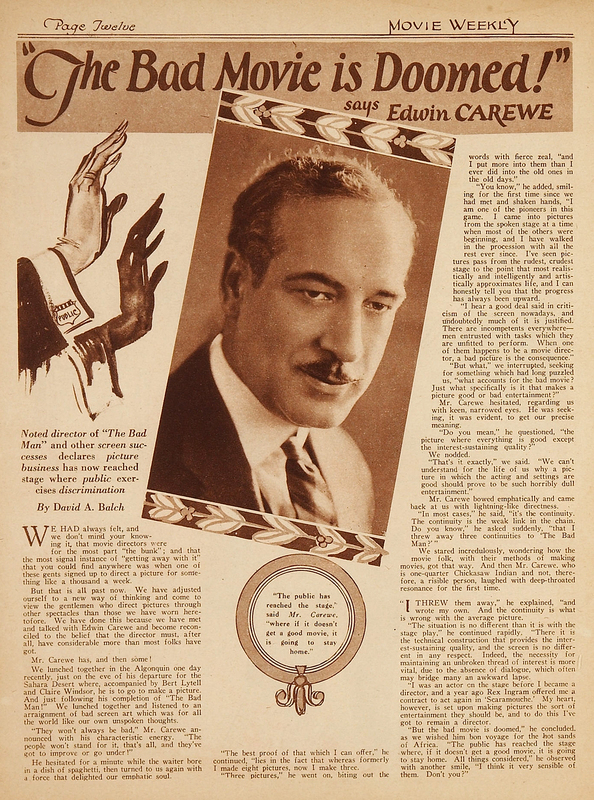 Edwin Carewe was a better director than prophet. 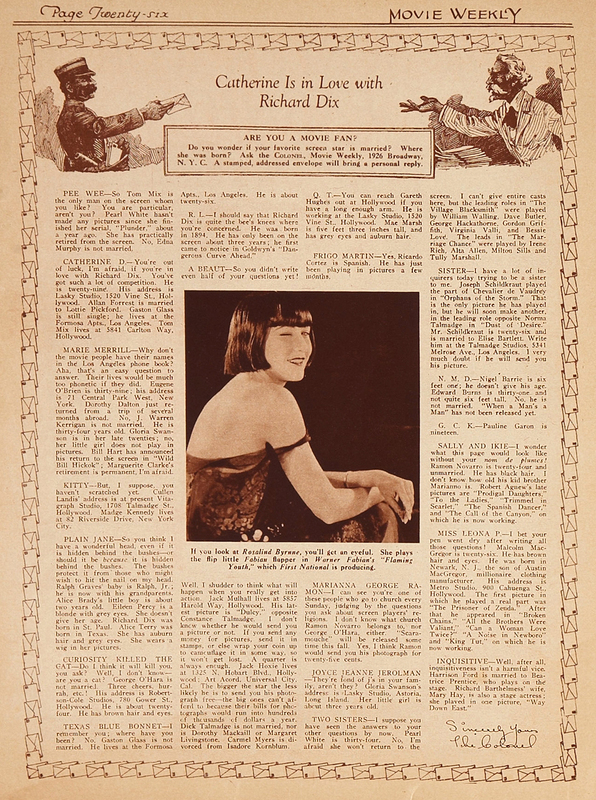 His best-known films were the Dolores Del Rio vehicles Ramona (1928) and Evangeline (1929). 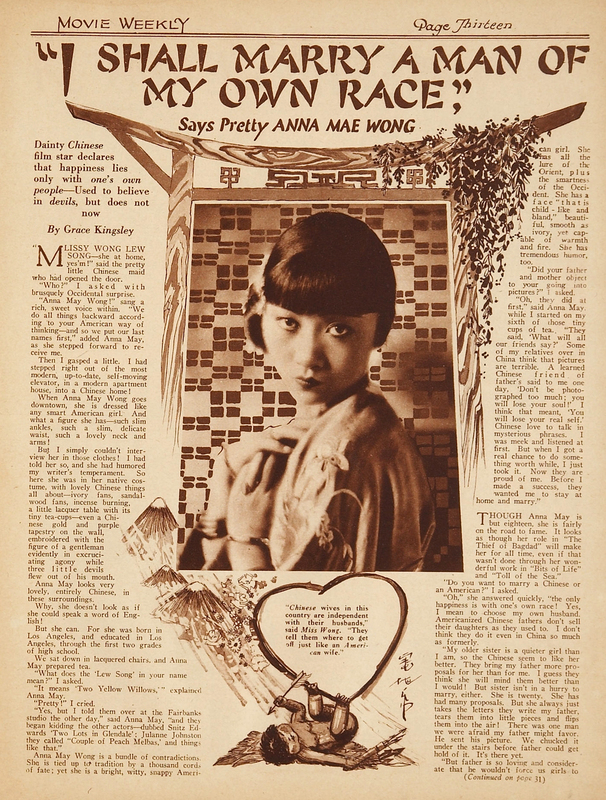 Anna May Wong offers up a prediction of her own, but doesn’t hit the bulls-eye either. Her career growth would be stunted, largely by 20th-Century queasiness about white screen heroes getting too close to an Asian woman. This interview might have soothed some of those qualms. But is she being candid here… or just canny? 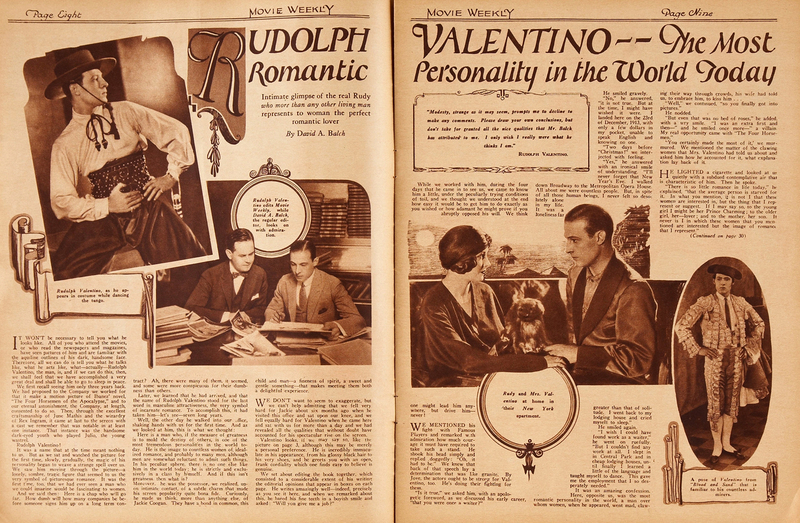 Here are a couple of selections from this issue of Movie Weekly. 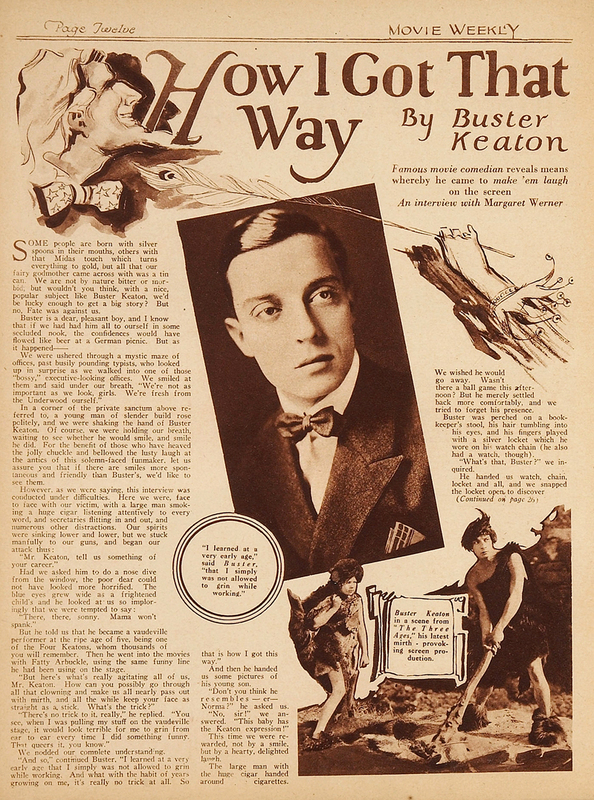 Movie Weekly ran at least a couple of Keaton articles like this.